My tent on the peninsula of Ekkerøy. After finishing my Bachelor's degree in June (the main reason I didn´t get to write for the past half year), I went off to the Varanger peninsula in arctic Norway for a five-week camping and photography tour, and, as expected, it was an absolutely marvelous experience (though, of course, the best experiences were the unexpected ones). I got to see mesmerizing landscapes, had beautiful encounters with the birds and other creatures living in the area and also met so many kind and interesting people. So, what actually happened up there? There is no way I could give a full report on five weeks of hiking and everything that happened in a blog post, so I will just talk about the highlights here (which is still a lot for a blog). Essentially, my trip began at Kirkenes Airport, not far from the Norwegian/Russian border. Trains only go until Narvik, so although flying is not my preferred option for travel in terms of comfort or environmental impact, it is pretty much the only option to get that far north in Europe (except for driving by car for several days). From there I hitchhiked to Varangerbotn, a small village located exactly at the end of the Varanger Fjord, therefore marking the beginning of the peninsula. From there I began my tour along the southern coast of Varanger, setting up camp at points along the way. I used buses and hitchhiking to transfer between the different stops and then typically stayed for 2-3 days, doing day tours by foot around the area. A special highlight was Hornøya, a small bird island close to the town of Vardø, where I stayed two nights at the lighthouse. From Vardø, I took the Hurtigruten ferry to Berlevåg in the Northeast of Varanger and from there explored some of the hinterland with the Hanglefjell mountain as a special highlight. To get back home, I took the Hurtigruten ferry from Båtsfjord to Kirkenes and flew back to Hamburg. 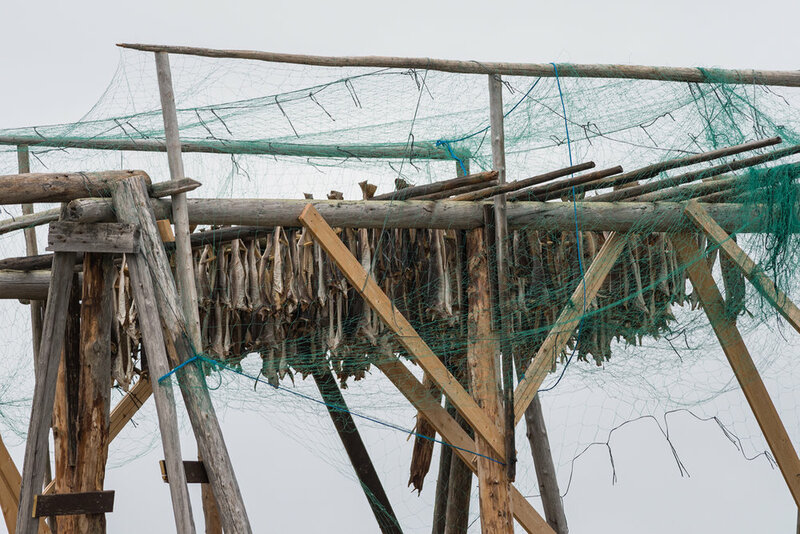 Next to birdwatching, salmon fishing is one of the most popular activities on Varanger. Varanger is located in the very Northeast of Norway, the last of a series of fjords and peninsulas extending along the Norwegian coastline to the Russian border. Random fact: The Varanger fjord is the only Norwegian fjord opening to the East. At 72 °N it is located well beyond the Arctic Circle, in fact if you just went around the globe at the same latitude, you´d end up in the Arctic Ocean off the North Alaskan coast. However, its location at the Bering Sea coast gives it a far milder climate than Alaska's because the gulf stream is transporting heat across the Atlantic Ocean. 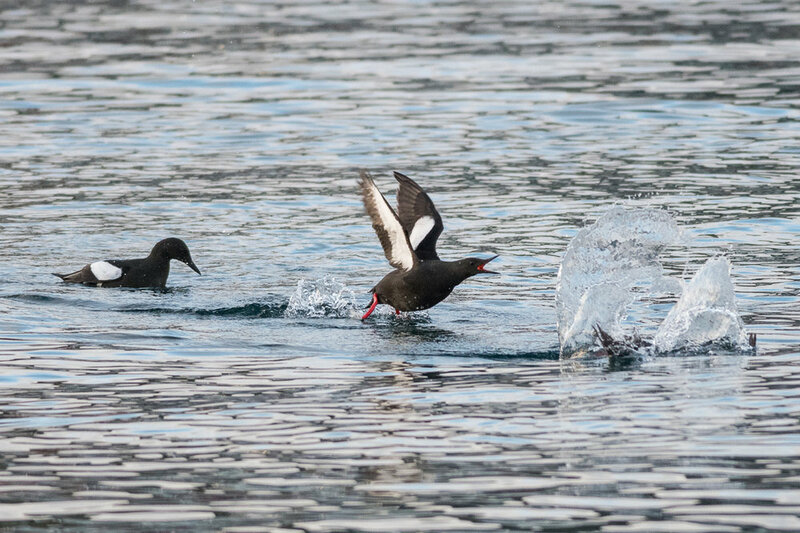 Not only is the climate comparably mild, but the sea around Varanger is among the most productive waters of the world, providing abundant food for many sea birds (as well as marine mammals). But, despite its remote location, Varanger is still comparably accessible with roads and small settlements spread all over the peninsula. 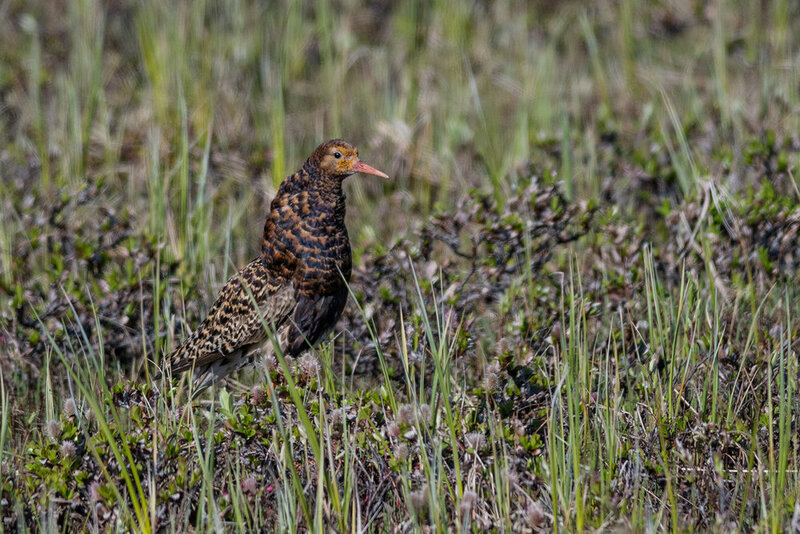 That makes Varanger very popular for birdwatchers from all over Europe and beyond and one of the very few locations were tourism catered to birdwatchers is actually an important part of the economy. 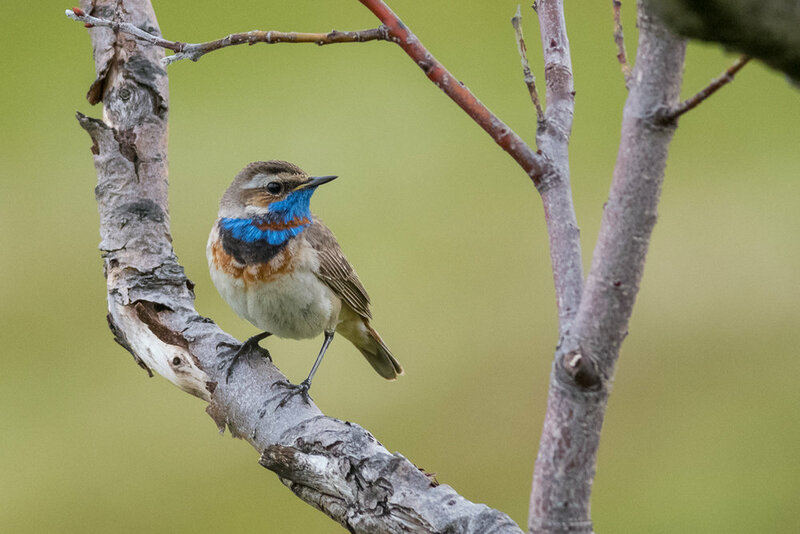 I have been hearing stories and seeing pictures from Varanger ever since I got into birdwatching. Particularly, my friend Knud from Hamburg has been going there since his childhood (see his amazing pictures here: www.knud-pfeifer.de). Originally my plan for this summer was to hike the Kungsleden in Sweden, but in spring I decided to do my Masters studies in Sweden. So, I was looking for an alternative just when Knud gave a talk on his Varanger tours. I spontaneously decided to move my summer plans to Arctic Norway, booked my flights and went on to finish my BSc theses. I did not give that decision a lot of thought, but it turned out to be a great one! For transfering between stops, I had originally planned to take buses and refrain to hitchhiking for situations where I could not get a bus. Buses there go three times a day along the coastal road between Varangerbotn and Vardø. But hitchhiking soon became my preferred mode of transportation. It began right with the first step, when I realized that I was arriving on a Saturday and there are no buses on Saturdays at all. So, I hiked out of Kirkenes to be on the right road in direction Varanger and was picked up by three guys coming from a concert in Russia. The driver was called Aramis and came from Iran. He was extremely nice, talked a lot but drove like a mad man and actually almost caused a high-speed car crash with a reindeer. Over the following weeks, I was taken along by a bunch of really interesting people, locals who live in the area all year round or have a summer cabin on the coast and of course also other tourists spending their holidays in the area. Talking to the locals was really fascinating to me. Living so far in the north, growing up with eternal night in winter and eternal day in summer gotta be quite unique. I found that quite a few of them told me that they grew up in the area, went South at some point but were drawn back to their home later on. So, would I advertise hitchhiking in general as a mode of transportation? Probably not. It worked great for me in that area as a single male. It was a lot of fun, but I doubt that it would work that well in a lot of other places. The first days of long hiking/camping trips like this one are always tough. It is a hard change going from the comforts of civilization with beds, kitchens, and so forth to sleeping in a tent, eating dry food, and - especially - carrying all your living on your back while hiking for hours through rough terrain. And adding my photo equipment to that package really doesn't make it easier. Whenever I start such a trip, I begin asking myself why I am doing this. Time and again I think that my memories of past trips must be far from how it really was, I should do something different, more pleasant for holidays. And every time I tell myself that it is just absolutely stupid to carry that much camera equipment on a hiking trip. And probably it is true to some extent. But on the other side, time and again, I get over it and once I am used to it, these tours become the most amazing experiences, and every time I look back, I am happy about every piece of photo equipment and the photos it got me. This trip, however, really had an absolutely terrible start and that was mostly because of the weather. Now, going to the Arctic even in summer you obviously don't expect constant sunshine at 30 °C. But this year, the weather up in northern Scandinavia was just totally messed up. First, the winter was far too warm with the lake in Abisko National park (where I was in February) not being completely frozen for the first time in over 100 years and then it just wouldn't end. I arrived to temperatures around 3 °C with constant light rain for the first week. And by constant, I mean that there was no five minutes without rain for two days in a row followed by a short break just to start again. Now, I don´t mind a bit of rain or even a lot of it. But when it doesn't stop for so long, you just can´t keep anything dry, everything gets moist, and there isn't much you can do. Hiking isn't fun in the rain, and when everything is wet and grey, there are not a lot of photos to take. So, I spent most of my time during the first week reading inside of my tent... not exactly the vision of a nice vacation in the outdoors. I was truly frustrated about the situation. But I knew that it could not stay that bad forever, and I got to see at least a few nice birds regardless of the weather - like the breeding pair of Arctic Skuas at Vestre Jakobselv and the Red-necked Pharalopes on Vadsøya. The first really nice day happened when I came to the peninsula of Ekkerøy. 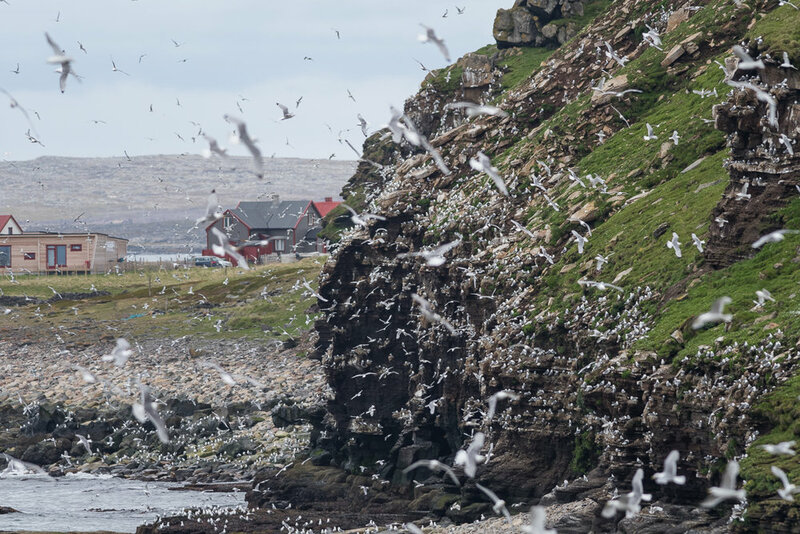 Ekkerøy is a small former island (now peninsula) with a bird cliff full of breeding kittiwakes. For me it was one the most beautiful moments to be there with my tent when the sun came out for the first time and I could take the panorama I now used as the title picture of this article. Of course, the weather did not immediately turn from terrible to wonderful. The next days there was still a lot of rain, but there were always interruptions of sunshine and that made for an overall much better experience. The next stop was the village Komagvær, from which I hiked towards the inside of Varanger peninsula, entering the National park at Komagdalen. Although I could not get very close for good pictures, I got to witness the spectacle of the male ruffs fighting over the females. 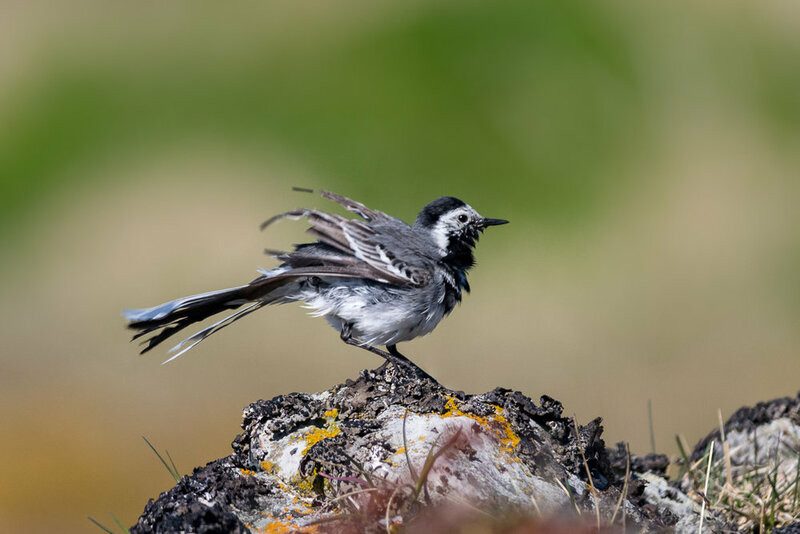 These are truly special birds with their impressive plumage, but, unfortunately, they have become a quite rare sight in central Europe due to habitat destruction. We have very few breeding pairs in Germany and mostly only get to see them during migration, so seeing their courtship display was really special for me. Vardø is a small town on an island in the East of Varanger. 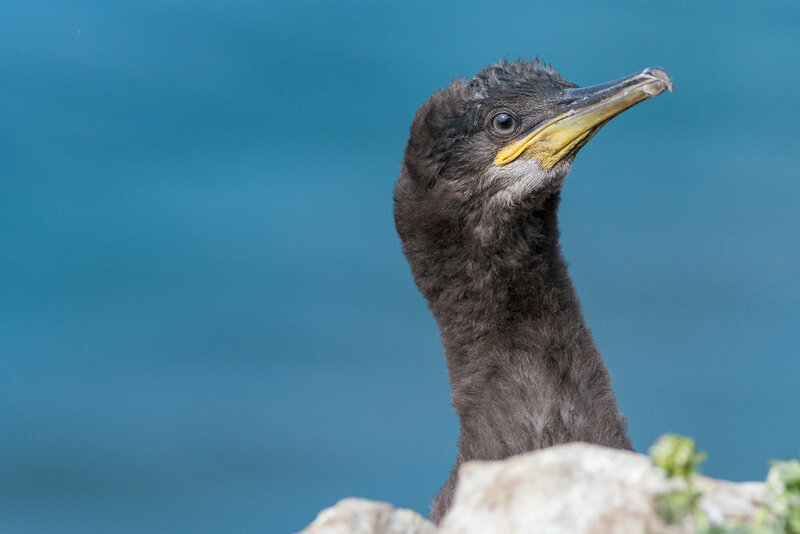 In terms of birdwatching it mainly hosts the harbor from where you take the ferry to Hornøya, but the island Vardøya itself is also quite interesting. In the East, the southern and northern parts of Varanger are not connected by roads, so I went through Vardø to Hamningberg and then came back to visit Hornøya and take the ferry to Berlevåg from Vardø afterwards. Around there I got some nice shots of common ringed plovers. There are plenty of these adorable little birds around Varanger, but it is quite hard to get close to them. Most of the time you hear them clearly though as they try to distract you away from their nest with loud calls. And sometimes they even pretend to be injured to make for a seemingly easier target until the intruder is sufficiently far away. For a fun experience, I came across some locals having an evening beer in the midnight sun one day. They invited me to join and we had a great evening with a house party afterwards. I was really surprised how easily a total foreigner like me was welcomed to their gathering! Hamningberg is located in an area that makes it seem like the last outpost of civilization. The road from Vardø to Hamningberg is narrow, leading through steep rocky cliffs with barely any vegetation. 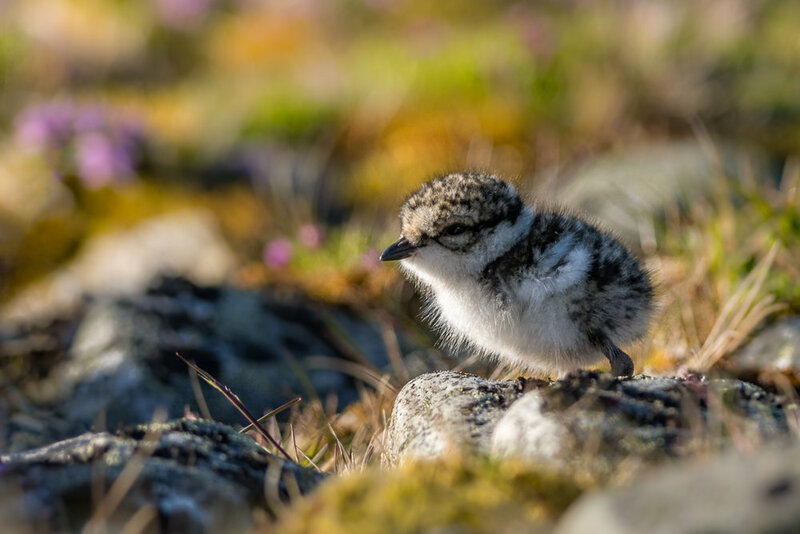 And yet, the tundra around Hamningberg is full of plovers with little chicks - I even came across the nest of an Arctic Skua with a just freshly hatched chicklet! There I also met a couple of Dutch birders who gave me a great tip with GPS coordinates where I could find horned larks. These were one of my main "target species" for the trip. 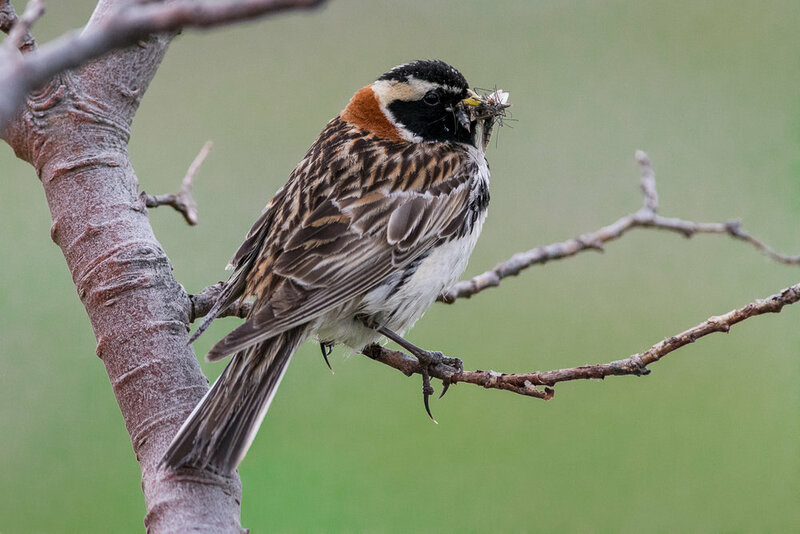 Similar to snow buntings (that I also saw near Hamningberg), Horned larks come to Germany during winter migration from their breeding grounds in the far North. And with their little feathered "horns" I find them to be absolutely amazing birds. So, I always wanted to see them in their breeding area and get some pictures close up. And when I came back to Svartnes, I found them exactly at the coordinates I was given and got to see them extremely close while gathering food! But before coming back to Svartnes and Vardø, I spent some more days in Sandfjord near Hamningberg (there are several Sandfjords around Varanger and Norway). Here, the river Sandfjordelva flows into the Bering sea and forms a sandy delta in the fjord with a dune landscape covered in shrubs and bushes. 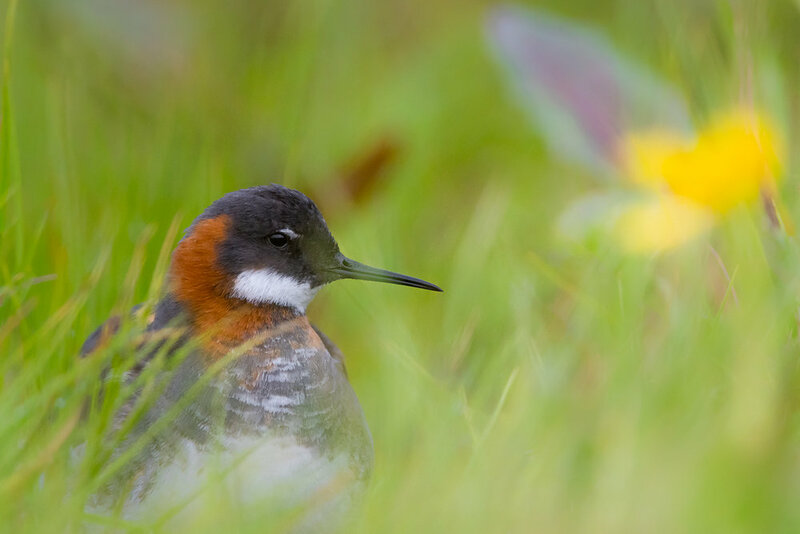 Coming there from the barren landscape of Hamningberg, it feels like a green oasis and it is an absolute paradise for birds with many many bluethroats and Lapland buntings, redpolls, thrushes and waders. And with the wooden remnants of an old bridge in the river, I got to experiment with multiple exposure photography that turned out really nice in black and white. 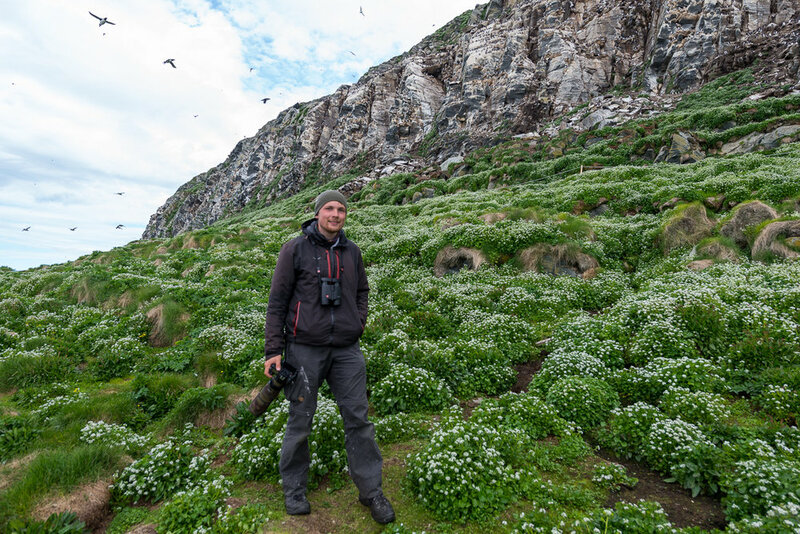 Visiting Hornøya was certainly a major highlight of the tour! 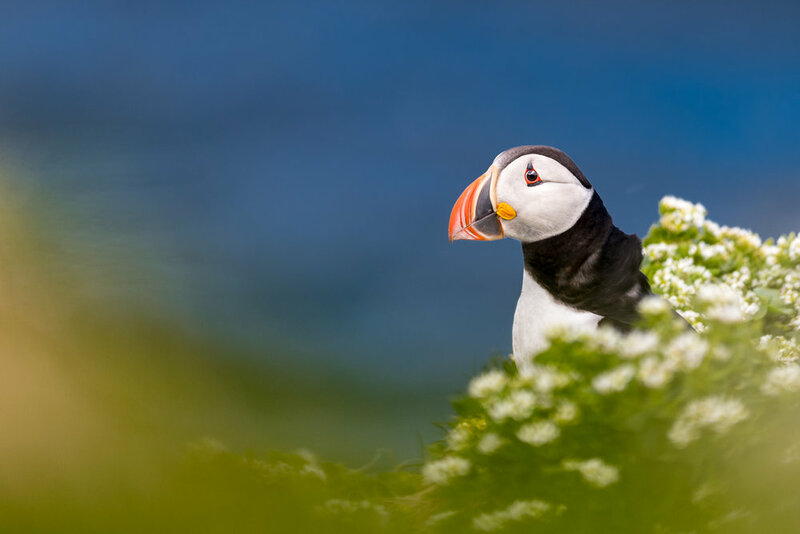 It is home to over 80,000 seabirds and represents the easternmost point of all of Norway. 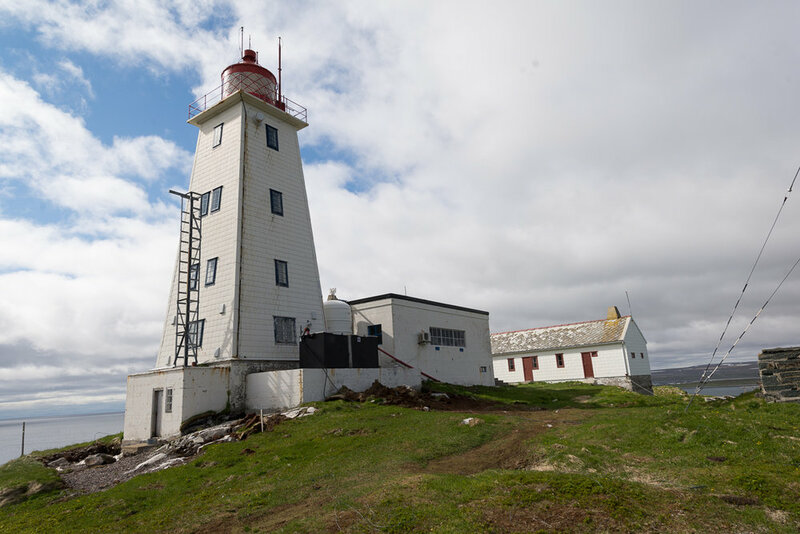 It can only be reached by boat and is uninhabited except for some scientists living in the lightkeeper's house to investigate the bird colony (the lighthouse itself is operated automatically nowadays). A few of the rooms in the house could be rented by visitors, so I did just that. That way I could finally sleep a couple of nights in a proper bed and spend the days surrounded by birds... paradise by my standards! The only drawback was that in the weeks before I arrived, a rock slide made the path from the lighthouse on the top to the bottom of the cliff impassable. So, most of the bird colony could not be reached from the lighthouse. But there is a second pier, so I shortened my stay at the lighthouse and spent two more days where I camped near Vardø and came over to Hornøya for the day by boat. The greatest highlight was to experience the jumping of the baby guillemots. 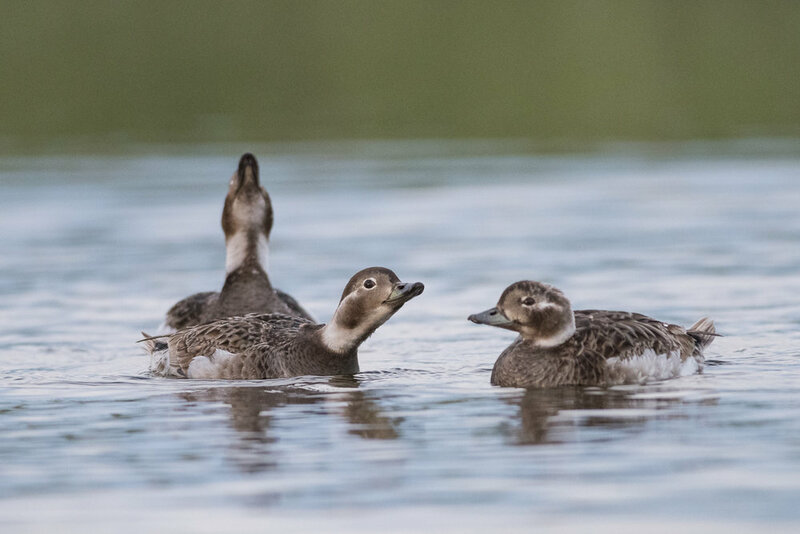 Once the chicks are just large enough to walk and swim, they jump off the cliffs to get to the water in greater safety from air and land borne predators. This happens over a relatively short period of time and normally at night. But in the Arctic, there is no night during the summer, and I had the great luck to be on Hornøya right for the beginning of this stunning event. These fluff balls must have incredible faith to take the leap tens of meters through the air onto bare rock and then make their way to the water where their parents are already expecting them. After my stay on Hornøya, I took the Hurtigruten ferry to Berlevåg in the Northeast of Varanger. I found Berlevåg itself and its surrounding relatively uninteresting (except for some nice birds, including two Glaucous Gulls that had been drifted South by a storm on the ocean a few days earlier and a Temminck Stint that let me take a few pictures in flight doing its characteristically buzzing song in the air). But south of Berlevåg on the coast lies the Sandfjord (yep, another one). 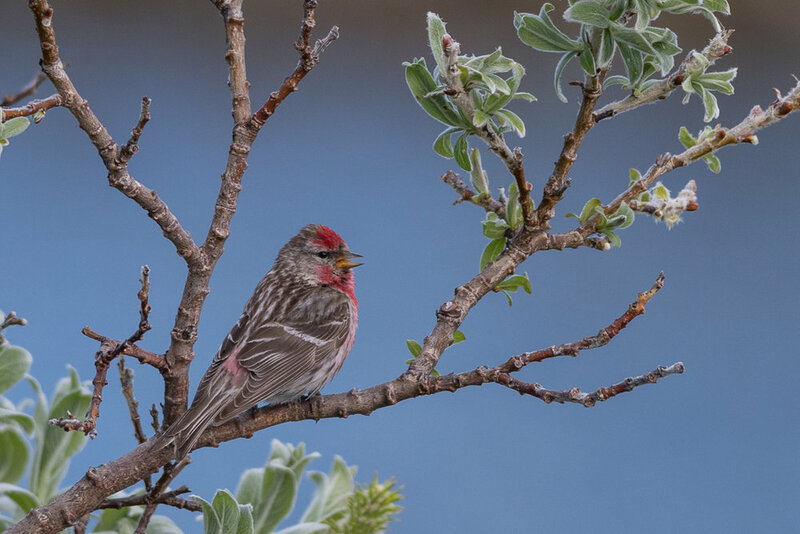 Not only does it have a stunning landscape with sandy beaches right in front of steep mountain cliffs, but it is also filled with bird life including plenty of bluethroats and even some Arctic redpolls that rudely disturbed my breakfast one day. Although, I would happily interrupt my breakfast for such birds any time! From there I continued my way south along the coast to Kongsfjord and Veines. Kongsfjord is a small village close to the peninsula of Veines, home to a breeding pair of Gyrfalcons and a really picturesque group of the typically colorful Norwegian wood houses. Unfortunately, it was very cloudy during most of my time there and I could only see the gyrfalcon, a ring ouzel and the displaying tysties from quite some distance. One evening, however, I had a wonderful dinner at the Kongsfjord guesthouse on Veines (really, it´s amazing, if you are ever up there, definitely have some dinner in Kongsfjord!). It was really grey and dark, but on my way back - I had almost made it back to my tent - all of a sudden, a hole in the clouds opened and let the sun through. That hole had been lurking around there for some hours already, but it had never been where the sun was, so I had given up my hope already. But that moment, all of a sudden, the sun came through, precisely lighting the houses of Veines. So I hurried back and made it just in time to take that panorama of this wonderful location in stunning light while being eaten alive by an armada of mosquitoes! And I found another surprise just on the side of the road in Kongsfjord: spotted orchids! I really wouldn't have expected to find orchids in the Arctic, yet apparently the relatively mild climate created by the gulf stream allows them to grow there, too. The final location of the tour was Hanglefjell, a beautiful mountain in the hinterland of Varanger peninsula. I hitchhiked there with a Swiss tourist who was quite staggered when I asked him to let me out on the road in the middle of absolutely nowhere. So, I hiked into the area and set up my camp right at the lake on the foot of the mountain. 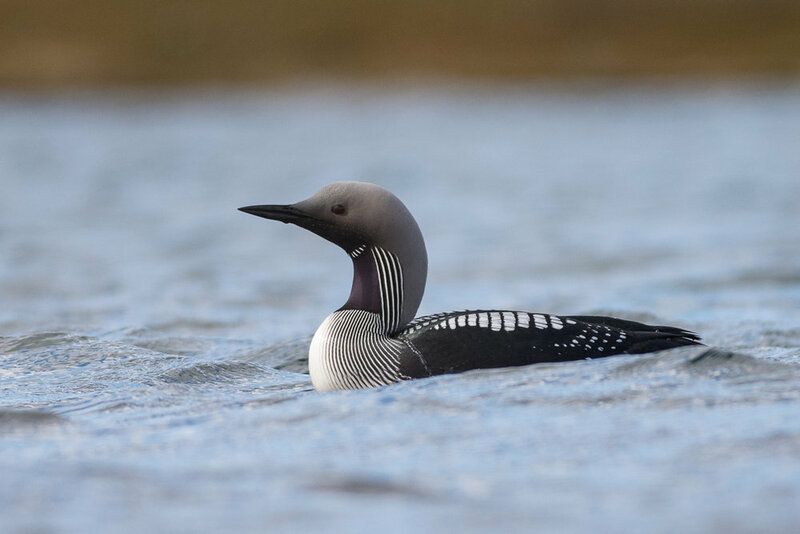 The lakes around were particularly interesting with long-tailed ducks and Arctic loons. 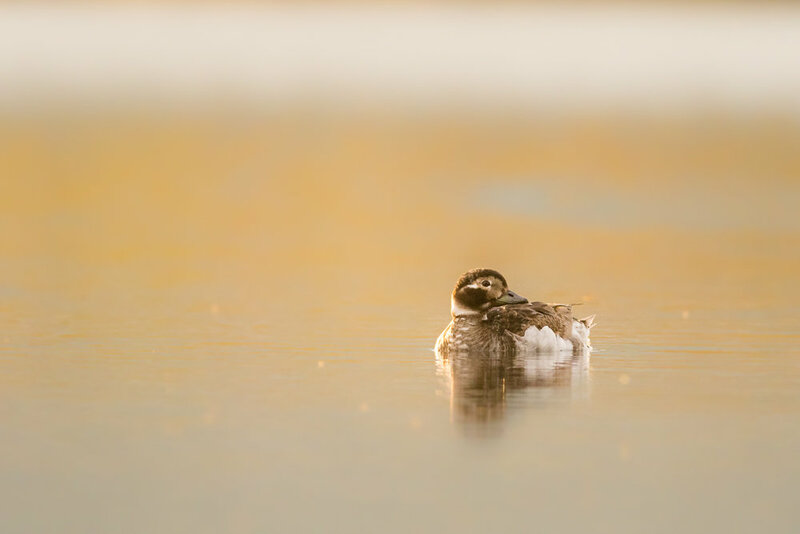 All of these were really shy and hard to get close, but on the third try hiding on the shore of a lake, I finally got really close to a group of long-tailed ducks even showing some summer courtship. And one time - I was actually just having a lunch break - a pair of Arctic loons got really close... such beautiful animals! Then I decided to climb the mountain. Not that it wasn't a great experience - it truly was - but I think that way I really gave the last blow to my foot. The week or so before, my right foot had begun to hurt while walking, not badly at first. but it got worse and worse. I knew I should be careful, yet I still decided to scale those rocks and ice-fields. Luckily it was almost the end of my trip and I didn't have much walking left to do. And the view over the whole region was definitely worth it. Plus, I got some shots of Rock Ptarmigans and Snow Buntings up there, so I was happy. So yeah, it was a long trip, it was challenging and exhausting, but I had a lot of fun and got a bunch of great experiences from it! Just one more thing: when I talk to people about these kind of journeys, they often seem to think that I am somehow really experienced and professional. I'm not. Yes, I have done quite a few outdoor tours already, but it's always different, and you make the experience as you go. So you shouldn't be scared off by lack of experience or equipment. Maybe don't go snow camping without good winter equipment, but other than that, just go for it. In the end, doing outdoor tours is a lot cheaper than staying in hotels etc., so even if your trip isn't perfect, you're not losing anything. Plus, at least within Europe you're never really far from civilization, so even if stuff goes wrong, you're hardly ever in any actual danger. For me it's now back to studying until the next adventure comes around. Here I write mostly about my travels and occasionally about other experiences I have in nature and photography.